Johnnah Johnson, a senior boarding student at The Hun School, reached an athletic milestone on Saturday, February 8th, during the Mid-Atlantic Prep League Championship. Johnnah scored her 1,000th career point and 15th in the game for The Hun School Raiders, during the fourth quarter against Blair Academy. Coaches William Holup and Julie Davis congratulate Johnnah Johnson ’14 on February 8th during the Mid-Atlantic Prep League Tournament at The Hill School. Johnnah Johnson, a senior boarding student at The Hun School, reached an athletic milestone on Saturday, February 8th, during the Mid-Atlantic Prep League Championship. Johnnah Johnson, a senior boarding student at The Hun School, reached an athletic milestone on Saturday, February 8th, during the Mid-Atlantic Prep League Championship. 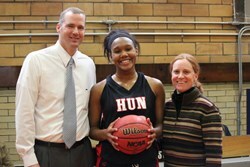 Johnnah scored her 1,000th career point and 15th in the game for The Hun School Raiders, during the fourth quarter against Blair Academy. The tournament took place at The Hill School. Johnnah is a four-year starter on the girls’ varsity basketball team. Scoring as many as 33 points in a recent victory over Mercersburg Academy, the 6’3” center is a strong leader on the 2014 team. She is also the first girls’ basketball player since Emily Gratch ’08 to reach the 1,000-point mark. In November, Johnnah signed a National Letter of Intent committing her to play basketball for Robert Morris University next fall.